Kidney 3 (KI 3) is the source point of the Kidney channel. In Chinese medicine the kidney is not only related to the kidney organ but it also encompasses your “life source energy”. That’s the energy you were were born with that declines as you age. This is a point you should always remember when you are giving a foot rub. Kidney 3 can help so many conditions, plus it just feels good. We could all use a little bit of extra love to help strengthen our life force energy, right? 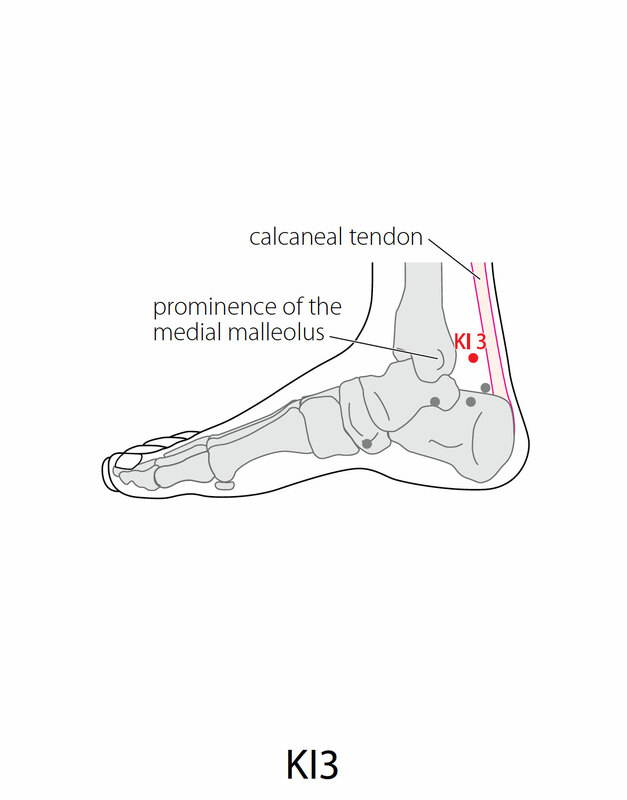 Location: In the depression between the medial malleolus and the Achilles tendon, level with the tip of the medial malleolus. Attributes: Shu-Stream, Yuan-source, and Earth point of the Kidney channel. TCM Actions: Enriches kidney yin; abates vacuity heat; invigorates original yang; and rectifies the womb. Indications: Sore throat; toothache; deafness; coughing of blood; asthma; irregular menses; insomnia; seminal emission; impotence; urinary frequency ; lumbar pain. Secondary Indications: Throat bi and swelling of the pharynx; toothache; kidney vacuity impotence and seminal emission; cold shan; difficult evacuation; mammary yong; cardiac pain; inversion cold in the extremities; damp itch and sores on the inside of the thigh; branching fullness in the chest and lateral costal region; kidney disease; heat disease with copious sweating; gluey sensation in the mouth; repletion dyspnea with fullness and phlegm tinnitus. Needle Information: Perpendicular insertion .3 – .5 cun. Moxibustion is applicable. Want a full acupuncture reference tool? 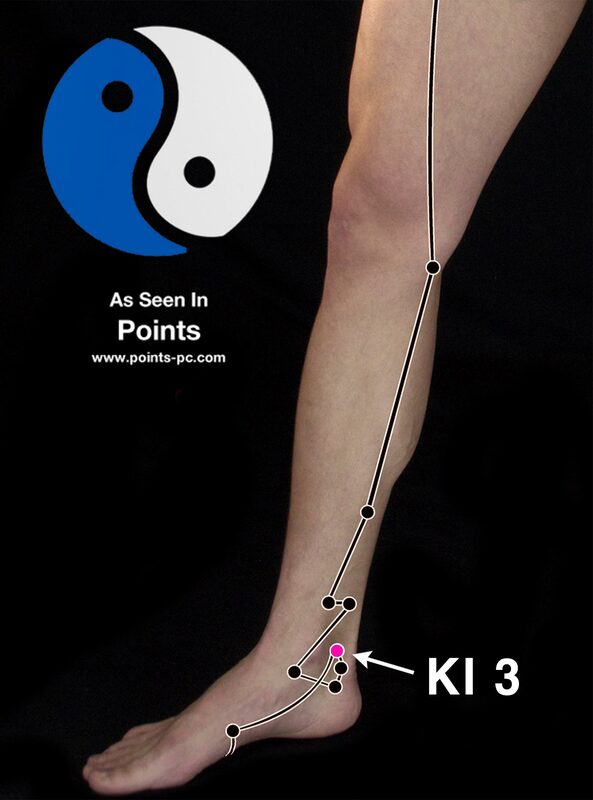 Check out Points Acupuncture Reference Software! Click here for full details.